The Baby Feed Wheel is an indispensable parenting product and new baby gift to help parents record Baby's feed times. A really useful and practical gift for all new parents, especially in those early weeks when one hour seems to just roll into the next and you loose all track of time!! 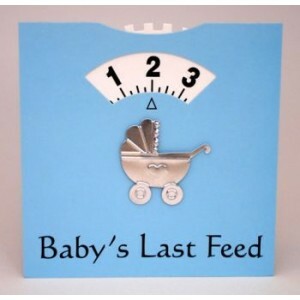 With "To" and "From" on the reverse and supplied with an envelope the Baby Feed Wheel is also the perfect congratulations card to send to family and friends expecting or celebrating their new arrival. A really helpful present to receive on the birth of a new baby, the Baby Feed Wheel also makes a lovely maternity, Baby Shower or "leaving to have a baby" gift. Baby Feed Wheels have been recommended in Practical Parenting, Pregnancy & Birth, and the Sunday Express magazines. Clever ideas  a brainwave: the Baby Feed Wheel. 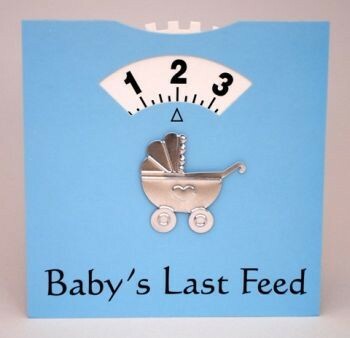 Its a congratulations card with its own dial to record the time of the last feed.